You can rely on our old friend ::vtol:: to consistently come up with innovative sounds/machines, and here's a cracker! "The Metaphase Sound Machine is a kind of homage to the ideas of the American physicist Nick Herbert who in the 1970s has created both Metaphase Typewriter (Fig. 1) and Quantum Metaphone (a speech synthesizer). These were some of the first attempts to put the phenomenon of quantum entanglement in practice and one of the first steps towards the creation of a quantum computer." Well you can't get much more innovative than this! "Robert Schneider (The Apples in stereo singer/producer) practices using the Teletron, a modified Mattel MindFlex toy that uses EEG sensors, to play a Moog analog synth with his thoughts." I've seen the future, and it scares the willies out of me. "My unusual instruments during my concerts are presented as sound sculptures and provoke curiosity on how they will sound. I position myself in the center of this set-up, as an orchestra conductor, creating an integration between Man and Machine. Who directs who ? who plays what ? who plays the instrumental notes ? who processes the computer ? I tell stories, imaginary sound poems. 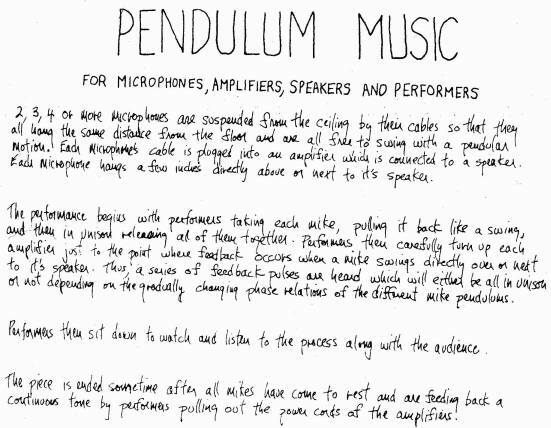 The audience is invited in a surreal world where they will hear new sounds, as they can see me operate my sound machines." Give it time - it's a slow start, but it builds and builds. Magnifique! This is an oldy but goody from the famous minimalist composer. Pulling out the power chords instead of turning the amp off? Ah showbiz and the minimal possibility of fire or electrocution! 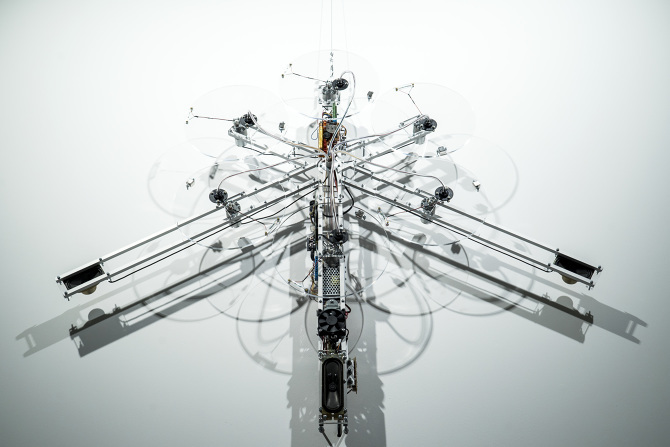 "Robots, kinetic sculptures, modified technology and real live sea monkeys populate Robbie Thomson’s new work, inspired by the farthest extent of our perceptions. Infinite Lives turns Kings Place into a science laboratory, as the weird and fascinating objects come to life with special lighting effects, video footage and an irresistible electronic beat, experimenting with the limits of our own consciousness." "The Eggiophone is a fully chromatic controller instrument made out of plastic eggs, conductive black paint made by Bare Conductive and a Teensy microcontroller. In addition to the pitched eggs there are 3 potentiometer knobs and 5 momentary buttons which I use to move up and down octaves and as gated loopers. As the Eggiophone is a midi controller it can be used to play any sound in the world when connected to midi audio software such as Ableton, Logic, Reason etc via a standard USB cable." 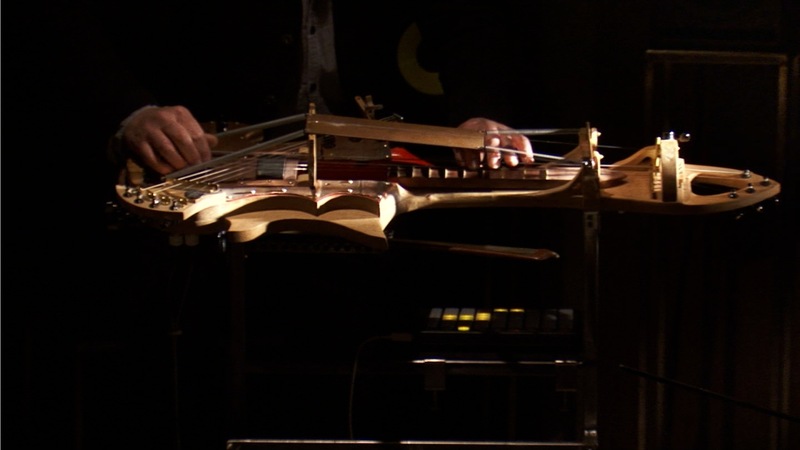 Ooh, I do love people who create bizarrely new instruments like this! Here's another innovative recording method - UkuRobot is a programmable ukulele player. It's a little pedestrian, but the shot of its mechanisms is certainly intriguing, and I suspect it's capable of a lot more. I live by the railroad. In May, I was working on a song using my Logitech headset in the garden. I started recording the trains and the crows flying around. Then I ran these sounds through GGate (to get rid of noise between takes) and finally I put MSpectralDelay on this, with the UFO preset at 50%. Worked wonders for my mix. Richie Royale wrote: I once recorded a printer/photocopier at work which when it had run out of paper, would make a very robotic/mechanical sound and then beep in a kind of flatline way. My GOSH what a video! One thing's for sure: to find time for that sort of video, they must be single. Can't beat a bit of technical lego. I've always wanted to record both sound and video of heavy industrial plant in operation. These sounds and sights can be incredibly hypnotic. In the industry where I've worked for a good many years, you've got everything from printing presses, magazine binders, leaflet and packet folder/gluers. Then there are the big daddy cardboard box die cutters slowly and endlessly stomping out intricate shapes. All of this under the same roof. Each has it's own rhythm which you pick up as you move from one area to the next, but just occasionally there is the totally magic instance when they all synchonise. It used to be that you'd see grins on peoples faces, but not any more - which is rather sad. Folderol wrote: I've always wanted to record both sound and video of heavy industrial plant in operation. These sounds and sights can be incredibly hypnotic. It would be interesting to hear a composition based on this experience -John Adams' Different Trains comes to mind. I remember how my music club in high school found an abandoned factory in 1990 and went there to sample things. We were about twenty kids and suddenly an instrumental piece emerged of its own, not totally unlike the photo copier stuff but even more industrial. Then the night watch came and pointed at us with his big flashlight whereupon we ran off. The track actually became the intro to the yearly school rock tape. Those were the days! "This work consists of a set of sixteen bottles – with air blowers attached to each one of them – and a wind vane. The vane is fixed on the outside of a window and detects the direction the wind is blowing. Inside of the room, the motor starts blowing air into the bottle that corresponds to that particular direction. This event generates a smooth sound, and each direction has its own pitch. The bottles are arranged in a circle, similar to the shape of the compass rose, depicting the eight principal winds and the eight half-winds." More triggers set at different corners of the building? blinddrew wrote: More triggers set at different corners of the building? Yep, that would work beautifully Drew! Just had to post this, as it's SO inspirational to anyone who fancies some new sounds of an electroacoustic nature.